It seems every day I see a print article or blog post explaining how Millennials face challenges that are different from previous generations. According to experts, among other things, uncertain futures, pressures to succeed, fear of failure, etc. can cause Millennials to experience anxiety, depression, and a host of other psychological or physical ailments. This is why we have created a new e-learning course called Time Management in the Age of Anxiety. Hopefully, I am not over-simplifying but articles like this make me think back to my days teaching time management skills. I was sure habits like goal setting, daily planning, prioritizing, etc., helped reduce stress … and contributed to a sense of well-being and achievement, as you are getting things done, coming through on your promises and commitments to others, and making steady progress toward your goals. I used to encourage my students to make an end-of-day short list of accomplishments, so they could go home knowing they did the best you could with the options and resources they had. As the saying goes, “You can be winning, but feel like you are losing if you don’t keep score”. To me, less stress was achieved by making progress every day, and reflecting on your short-term accomplishments. Are these basic time management skills a lost art with Millennials? In my very humble opinion, and with no psychological background whatsoever, if my Millennial child or employee was suffering from anxiety or depression (besides professional help and/or medication), I would encourage them to brush up on old-fashion time management skills. In my mind, these skills result in the opposite of anxiety and depression … confidence, well-being, motivation, progress toward your goals, and doing what you need to be doing at this particular moment – and not wasting time and going in circles. 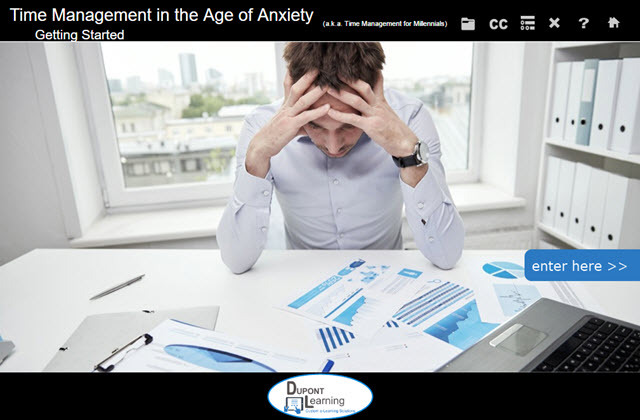 With Millennials in mind, I went back to work and re-positioned our time management e-learning course specifically for Millennials – Time Management in the Age of Anxiety – and offer it up free from our website – no strings attached.